Both the family planning sector and the environmental sector will be interested in this synopsis of findings from a study of the first four years of the Tuungane integrated population, health and environment (PHE) project in Tanzania. Analyses of the 2011 baseline and 2016 midline quantitative data, and additional qualitative data from 2016, measured the project’s progress and shed light on the contribution of the project interventions to building resilience, and on the links between family planning and other components of resilience. 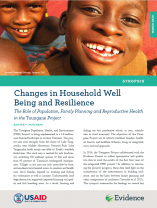 This synopsis focuses on several key indicators of resilience that relate to population, family planning, and reproductive health. Sign up here to be notified when further findings from this research are available.